In a skillet over medium-high heat, brown beef, onion and green pepper. Cook until beef is not longer pink; drain. 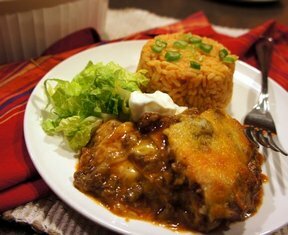 Add taco seasoning, enchilada sauce and chili powder to meat. Stir to combine. 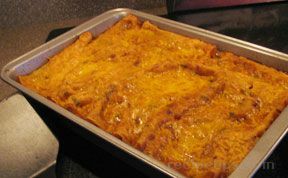 In a casserole dish, layer tortillas, meat mixture and cheeses. Repeat until all meat mixture has been used. Bake in 350 degree F oven until warmed through and cheese has melted, approximately 25 minutes. 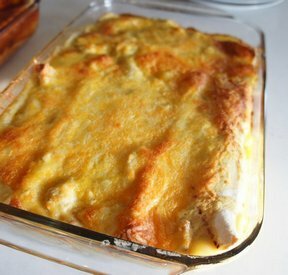 "One of the best enchiladas I have had. I used Ole El Paso sauce. I will be making these again. 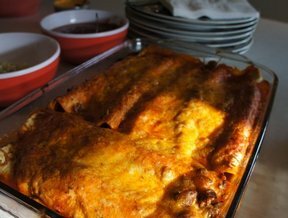 Let the enchiladas sit for 5-10 minutes before cutting into them to thicken it up a bit."